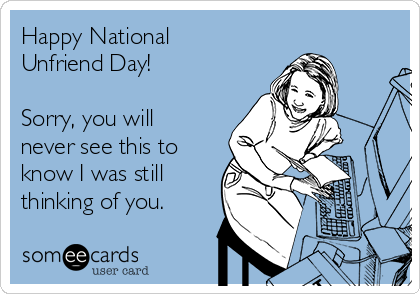 Happy National Unfriend Day! That one day a year that it's socially acceptable to purge your Facebook account of those you don't like. When someone unfriends me, with no explanation, I feel a little hurt. Okay, maybe more than a little hurt. I'm the type that wants to know why they unfriended me. I say this, but I'm also happy that I no longer feel obligated to like their cat photos or read about their political views. But, today is the day that you can unfriend to your heart's content and no one can be mad - until tomorrow. 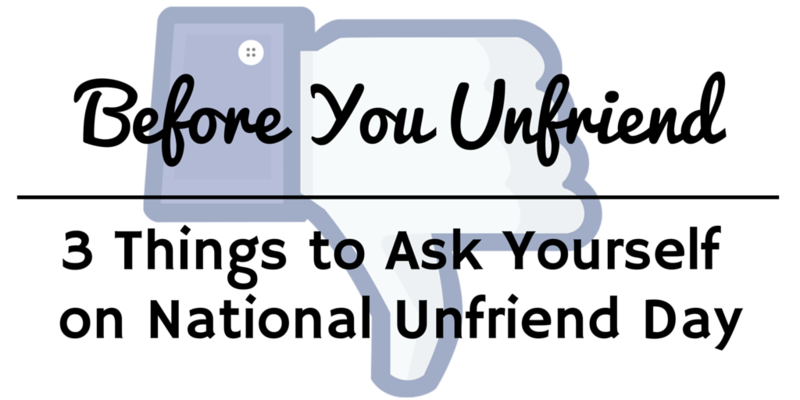 Here are three things you should ask yourself before you click unfriend. 1. Would you notice if they unfriended you? I've been unfriended several times over the years. I may not even know about some of the people who have unfriended me either. I'm sure that there are 'friends' who will never know that I unfriend them. And, sometimes, even real life friendships fall apart due to neglect and unfriending them is closure. I've unfriended someone because they didn't go to my Mom's funeral. I figured if they didn't know she died, we really weren't friends. My point is, unfriending someone who will never notice is not the same as dumping a friend without cause. 2. Was their friendship request the most contact you've had with them - ever? Getting a request from someone you went to school with or worked with can be pretty strange when you only knew them in passing. Sometimes, I accepted out of curiosity and was surprised when we bonded online. The people I didn't bond with are going today. 3. Do you dislike this person in general? This is self-explanatory. 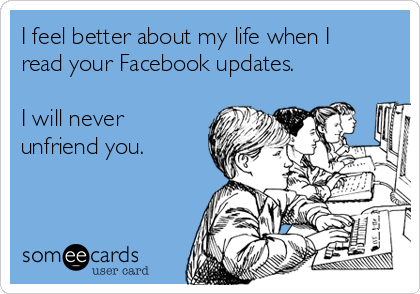 If you can't stand to see their daily oversharing or if their steady stream of game requests annoys you - cut them out of your Facebook life. If you answered yes to anyone of these questions, then you should unfriend. Unless, of course, you want to feel better about your life by reading their drama then by all means - stay Facebook friends.